Chief Election Commissioner Shri O P Rawat stated that a review of the program will take place in the next three months. Election Commissioner Shri Sunil Arora said, “We should go far beyond the bureaucratic measures to overcome the barriers. Technology has the capability to fill the gaps and it shall be explored to its fullest potential. Election Commissioner Shri Ashok Lavasa remarked that the set of recommendations received from the Consultation will be examined properly and efforts will be made to implement the same in a time bound manner. The Commission also facilitated two blind voters with Braille enabled EPIC Cards marking the first step towards this initiative. The fruitful and meaningful deliberations held during the two day consultation resulted in a comprehensive “Strategic Framework on Accessible Elections” which will help in making electoral process more accessible in the forthcoming State and National Elections. The Framework includes 14 important parameters; Identification of Barriers and respective solutions, Voter registration and polling, Inclusive Voter Education, Leveraging Technology for Accessible Elections, Research and Knowledge Sharing, Role of Partner Departments, Educational Institutions, CSOs, Volunteers and Media, Training and sensitisation of Staff, Alternative Voting Methods, Legislative Initiatives and Special four tiered Committees on Accessible Elections. 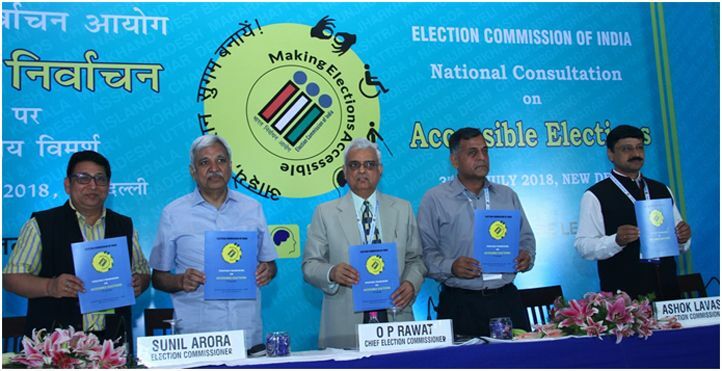 The Consultation was the culmination of more than 3-month long series of District and State Level Workshops undertaken as a part of ECI’s theme for the year- 2018, Accessible Elections-to identify barriers/gaps in the inclusion of PwDs in the electoral process, assess the present accessibility policies in place and put forward recommendations for addressing barriers to enhance the participation of the differently-abled. The Election Commission of India works on the premise of ‘No voter to be left behind’ and is committed toinclusion of all categories of voters in the electoral process to achieve the desired objective of universal adult suffrage as per its constitutional mandate. The Commission is committed to building an equal access framework for Persons with Disabilities (PwDs) supported by the fundamentals of responsiveness, respect and dignity to enhance elector confidence among them; and support initiatives for improved service offerings to enhance their electoral participation. Identifying barriers and finding solutions to the same has to be a continuous process. A system of regular, periodic feedback shall be taken up. Well designed approach with strategic interventions including technology integration can help in obliterating barriers. Customised voter education to cater to the different requirements of PwDs shall be taken up to empower them for electoral participation. All voter education content shall be accessible format. Focussed and need based interventions shall be taken up under ECI’s flagship voter education programme SVEEP to engage PwDs and also to sensitise their friends, families, polling officials, security officials and all other stakeholders. This would essentially include (i)User friendly websites for PwDs of different categories. (ii) Accessible Technological Tools for facilitating PwDs of different categories to cast their vote (iii) Solutions for assisting voters with disabilities through technological innovation, research and integration. (iv) Accessible Media including Social Media Communications. A continuous search for best practices, international and domestic, through detailed study and research on all areas of participation by PwDs and sharing of experiences to help formulate enabling policies and interventions, to aid, assist and facilitate the participation of PwDs. To explore and build partnership and commitment with Ministries and Departments to evolve and carry forward the interventions to electoral participation of PwDs. The Commission has already issued directions for setting up of Electoral Literacy Clubs (ELCs) in educational institutions etc. Setting up of ELCs in educational institutions dedicated to the PwDs shall be expedited and the ELC resources shall customised to match disability requirements. To assess the potential of CSO’s and assign specific role in assisting equal access and capacity building through well designed partnerships. CSO’s potential to build partnerships should be utilised subject to their non partisan nature. utilise the potential of Media in taking forward voter education and to engage PwD’s for increasing their electoral participation. Media can actively contribute to an effective and successful integration of persons with disabilities in the electoral process. Poll volunteers from among future voters can organised from educational institutions, and Chunav Pathshala, (ELCs for Communities) and trained to assist PwDs, besides from among NCC/NSS/NYKS and other non-partisan voluntary groups. The initiative will be subject to provisions of Rule 49N. Training and sensitization of the election is important so that they are empathetic to the needs of PwD voters. The training shall be factored into regular training to the staff as also for the registration and facilitation of the PwDs. Alternative voting methods like advance voting or early voting, voting from home, Postal vote, transport assistance to PwDs or mobile polling station concept shall be looked at without compromising on the essential requirements of sanctity and secrecy of vote. The scope of assistance to PwDs for participation is wide and diverse. Need for legislation shall be examined for enhancing electoral participation of the PwDs. Committees shall be formed at National, State, District and Assembly Constituency level with members from departments as well as stakeholders to review implementation of the directions of the Commission on ‘Accessible Elections’.